The courtyard swimming pool never has wind! 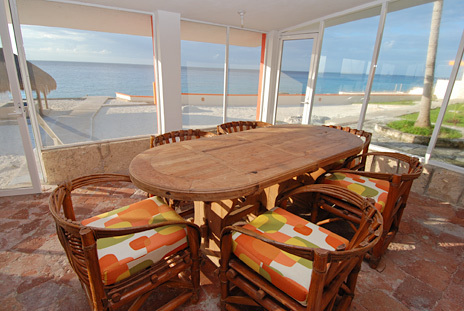 Mayan name for this Cozumel vacation villa is: Nahchentuhunah (or house alone). Located about two miles north of San Miguel, the Villa Maya has 5 B.Rs, an incredible oceanfront with comfy palapa and views that are unsurpassed. Snorkeling in this area is great. 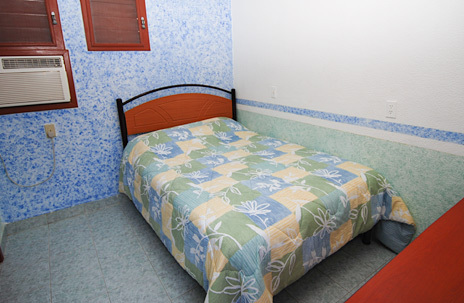 The villa is located just north of the Coral Princess and just south of the Hotel Fontan. 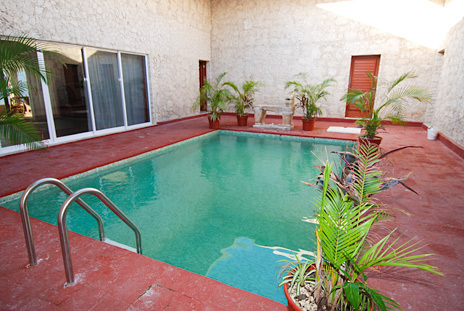 An interior courtyard features a large swimming pool along with lush tropical plants. Mayan storm god, Chac Mool stands guard amidst the palms along the pool. Four of the bedrooms are located just off this inside courtyard area. 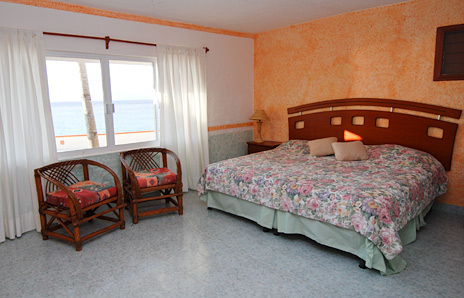 One bedroom has oceanview, private bath, air conditioning, large closet and king size bed; there is also a safe for valuables. 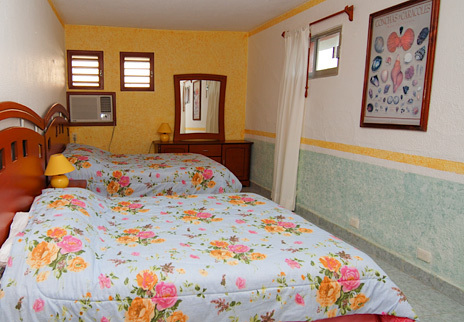 Second bedroom has couch, king size bed, private bath, large closet and air conditioner. Bedroom number three has one double, air conditioning, closet and private bath. 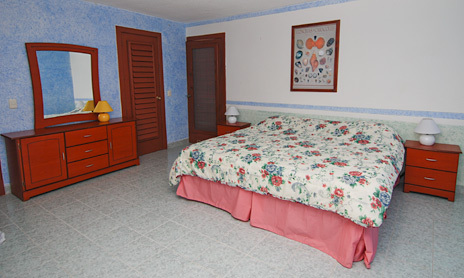 Fourth bedroom has king size bed plus two singles, closets, air conditioning and private bath. 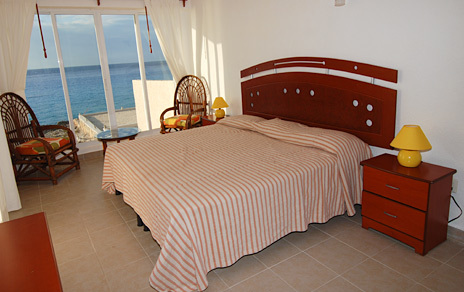 The fifth bedroom is a separate cottage just north of the main house; it has king size bed, oceanview, couch, closet, air conditioning and private bath. 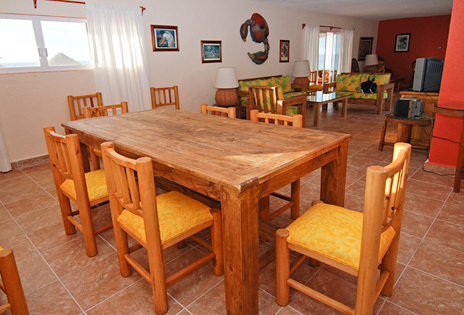 The Villa Maya has a full kitchen, though we recommend the cook service, which includes two meals per day during your stay. You'll be delighted with the succulent dishes that Isabel will provide. You'll sample some of the best food on the island with a fine assortment of authentic Yucatecan food served in your vacation villa. 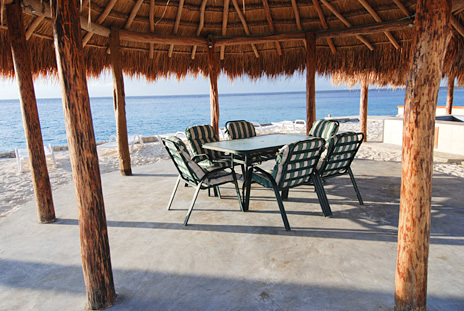 Dining area of the Villa Maya can seat 8 at one table and 4 to 6 at a second table. 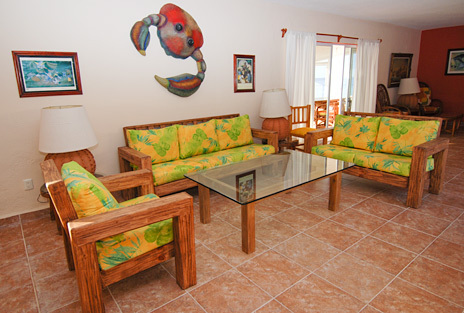 The large living area has four sofas and several chairs and living/dining area is air conditioned. There is also satellite TV, and telephone for local calls. A patio just off the living area provides a great spot to spend a lazy afternoon and catch the ocean breeze. The living room/patio area overlooks the ocean/garden area where there is another great "rest stop": a spacious palapa with plenty of lounge changes is a perfect gathering spot for cold cervezas or tasty margaritas served to you by Luis. This is a wonderful place to watch as the sun sets over the Caribbean. 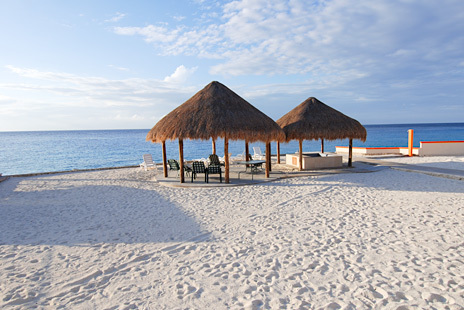 Just beyond the palapa, the brilliant blue waters of the Caribbean await for your snorkeling adventure. If you are a diver, your boat may be able to pick you up next door at the Coral Princess Hotel. Spend the day snorkeling up and down the coast where you'll find brightly colored fishlife. There is a freshwater shower waiting when you exit the water. Tropical plants and trees such as coconut palms, grape trees, rubber trees and various other varies provide a perfect setting for your tropical getaway in one of Cozumel's fine vacation villa. 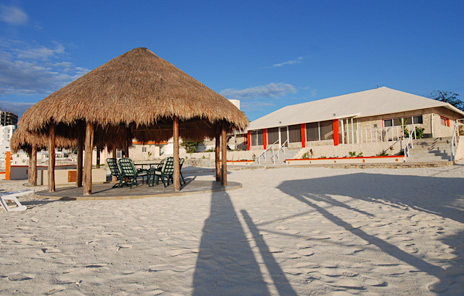 E-mail to reserve the Villa Maya! BR #3: 2 Queens, private bath.